At Juju, each table comes equipped with a self-service burner, on which you can grill up as much thinly sliced Korean BBQ as your choked intestinal tract can process. Options include sirloin, pork, chicken, short ribs, and the sizzling palms of friends who try to poach your meat. Every night, Becco cooks up three different pastas for the glutton about town: one in a simple sauce, one stuffed, and one with meat or seafood. 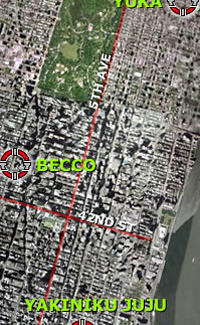 The special also includes a choice of Caesar salad or antipasto, and access to Becco's full $25-a-bottle wine list. This upscale carb overload is great for a meal with the guys, or the perfect send-off if your girlfriend's headed to South Beach to spend time with "an old college friend".